Someone shared a link on facebook and got mummy interested. 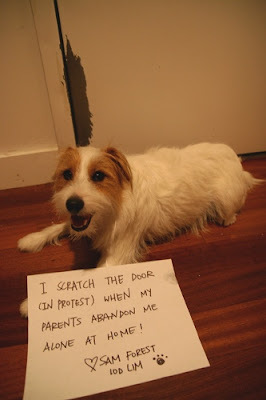 The link leads to a blog called Dogshaming which collates photos of dogs 'admitting' to their bad habits / behavior / secrets, pretty much just for laugh. Yeah, I'm sure that teaches us a lesson. 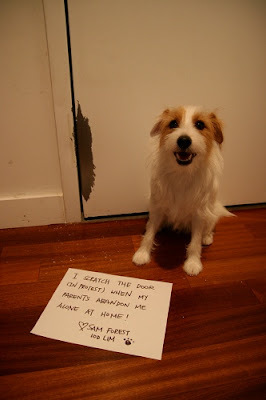 The blog is really entertaining and mummy couldn't stop laughing at the photos she saw. And I think she came to realise that I'm actually not that terrible a dog. LOL, I seriously pale in comparison to the rest of the dogs. But I am no angel (*grinz). Not surprising, mummy got motivated to 'shame' me and started thinking about my one big mischief. 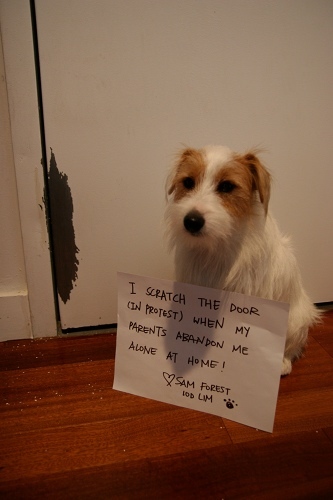 "I scratch the door (in protest) when my parents abandon me alone at home"
Oooh ooh... check out my achievement damage on the door. Mummy wanted a guilty look so that I will appear that I'm repentant. I'm actually quite proud of my achievement!! Hence the shots below are more realistic representation of how I actually feel. LOL, sorry mummy and daddy, the scratch is gonna get bigger the more you leave me at home alone, so think twice before you do it.